Blackpool have signed midfielder Barry Ferguson on a two-year deal from Birmingham City, with the option of staying on for a further year. The former Scotland international, 33, watched the Seasiders' 2-0 home defeat to Glasgow Rangers on Wednesday night. 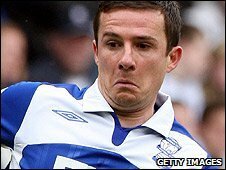 Ferguson, who played 84 times for Birmingham, is the latest player to leave St. Andrews following the club's relegation from the Premier League. He becomes manager Ian Holloway's sixth summer signing. Holloway will hope that Ferguson helps to fill the hole left in midfield by the departures of Charlie Adam and David Vaughan. Ferguson links up again with Kevin Phillips after the veteran striker joined Blackpool on a free transfer earlier this month. After winning 45 caps for Scotland, Ferguson incurred a ban in April 2009 for misdemeanours while on international duty and confirmed his retirement a year later, claiming he wanted to concentrate on playing club football.